Lars Lindstrom is lonely. 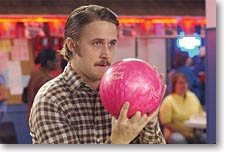 Having lost his mother during his birth, Lars (Oscar nominee Ryan Gosling) grew up with an emotionally devastated father and seems to have inherited his father’s sense of quiet and solitude, preferring to spend the time he’s not at work or in church alone in his makeshift garage home he shares opposite the main house where his brother Gus (Paul Schneider) and pregnant sister-in-law Karen (Emily Mortimer) reside. As the film opens Karen tries to make good on the recurring five dollar bet she shares with Gus, by repeatedly trying and failing to lure Lars over for a meal. While most of the inhabitants of his snow-bound small Midwestern town wish the sweet and good-natured twenty-something would begin dating, Lars shocks everyone one night by knocking on the door of the main house with the request of not only a dinner invitation but his wish that his relatives put up his girlfriend whom he’d met online. Eager to please, Karen gets out the new towels and a delicious meal only to be stunned with Lars introduces his Brazilian and Danish missionary girlfriend, the wheelchair bound Bianca, who is shockingly both scantily dressed as well as a life-sized plastic doll. Worried that Lars is suffering from mental illness with his fierce determination that Bianca is a real-life human, Karen and Gus take him and Bianca to their family doctor and psychologist Dagmar (Patricia Clarkson) who recognizes the young man as a functional individual suffering from a self-created delusion that will he will eventually rectify if they all go along with it. As a way to keep the talented Gosling in character, Canadian director Craig Gillespie and the entire crew treated Bianca like a real person, giving the doll her own trailer where she was dressed privately and having her appear on set only during the scenes she was scheduled to shoot, as noted on IMDb. While the film would no doubt have suffered without the charming screenplay and sensitive direction, the believability of the piece is owed to the entire cast, most notably the chameleon Gosling and also Mortimer and Schneider who struggle to look after their loved one and his “real girl.” Screened as part of the Scottsdale International Film Festival, Lars and the Real Girl will be released in theatres in the fall of 2007.